One characteristic of improvised music in this century has been a growing commitment by some practitioners to engage with outback Australia. The last time I experienced Warmun (in a remote part of the East Kimberley) was with my partner Hollis Taylor. We’d just endured a night of hell when our campervan was overrun with hundreds of creeping, crawling, biting critters that had joyfully hitched a ride with us (evidently caused by accidentally parking on the site of a dead kangaroo). The following bright Sunday morning found us waiting for the petrol station to open with the hope of a new day. The most endearing quality of that place was that the petrol pumps were all painted up in traditional iconography — as were the rocks nearby. The rocks are still there, but the petrol pumps have been replaced with some corporate logo horror which shall remain as nameless as it deserves. The relationship of white Australians to their Indigenous brethren remains a permanent news item — an open sore that never heals. The recent debate about colonial statues is typical of how contemporary a trauma it remains — certainly for blackfellas, and for many whitefellas too (see Stan Grant’s “Between catastrophe and survival: The real journey Captain Cook set us on“). The early thugaroo Lachlan Macquarie, whose ubiquitous name is impossible to escape in NSW (he plastered it over everything he could get his hands on), had a new statue plonked down in Hyde Park as recently as 2013 under the watch of no less than Lord Mayor Clover Moore. Clover, how could you? I arrived in Sydney in 1976 and a few years later I ran into one of the many contradictions of our confused Australian culture. While playing in a country and western band (covering completely ludicrously displaced tunes like “I’d rather be an Okie from Muskogee”) in outback Queensland, I was gobsmacked to realise that, along with white audience supporters of small-time dictator Joh Bjelke Petersen, there were many groups of Aboriginal fans of country music. They loved the stuff. I couldn’t, or wouldn’t, put the cultural ramifications of that together, and so determined that I best stay clear of working with Indigenous culture as it would most likely turn out for the worst (not that there is anything inherently wrong with country music as originated and played well in the USA by citizens of that country; it was the unquestioned import that disturbed me). And now here I am in Warmun, deeply involved with a regional residency organised by the intrepid Tos Mahoney of WA’s Tura New Music. Tos has been building relationships with remote communities of The Kimberley for most of this century, and based on the trust he has nurtured, some extraordinary results are showing. I am contributor and beneficiary of this ongoing work. The first thing that has to be asked is why anybody from Warmun would even talk to a whitefella, let alone collaborate on a musical adventure. Like many outback communities, Warmun is something of a refugee camp, with survivors of various nations who have had their land first stolen, then have been subjected to employment as feudal serfs, then kicked off their land again when the white owners were legally obliged to pay a living wage. In addition, Warmun was wiped out by catastrophic flooding in 2011 (there is a large fridge still sitting in the branches of a tree six metres off the ground) followed by the crooked activities of a builder and serial conman. Contracted by the WA Department of Housing, Craig Dale allegedly embezzled $3 million of federal money in the rebuilding of the town. Earlier, in 2001, something similar happened when phantom payments amounting to thousands of dollars were made under the stewardship of convicted criminal Kevin Maxwell Curnow, causing the town’s corporation budget to collapse with $1.5 million of debt. Somehow, the Gija people are a forgiving lot. It is a privilege to work among them. So what’s the project? It’s another manifestation of The Wreck — the transformation of a car wreck into a musical instrument [a project commenced by Jon Rose in 2012 and continued with Tura New music in 2016-17]. 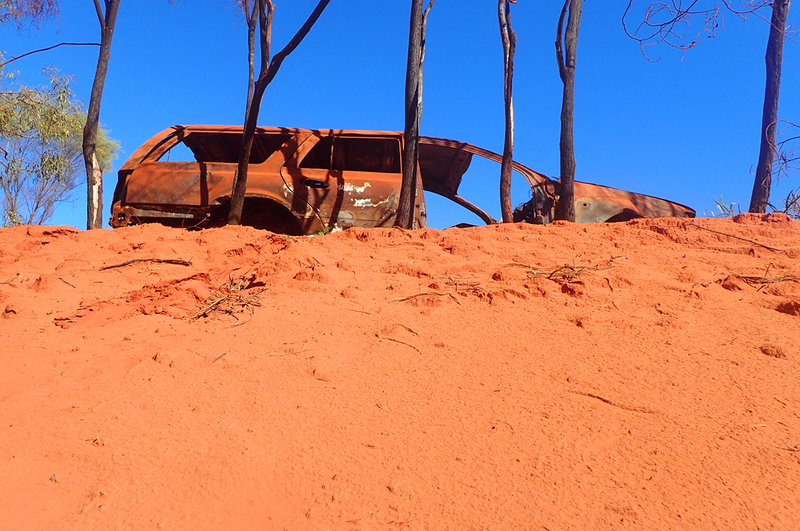 Wrecks are iconic markers of the outback. While mapping this continent performing the Fence Project, I started photographing the hundreds of wrecks that I came across. Leave a wreck long enough and it morphs entropically into the landscape, indeed eventually bedding down in company with the raw red constituent chemicals from which it originated. You can’t just rock up to an Aboriginal community and pick out your wreck and go to work; that would be a non-starter, as all the wrecks belong to someone. They are not simply detritus; former objects of mobilisation that have themselves become immobile are, once the spare parts have been selected, too expensive to destroy or move to an official dump. These wrecks are family. They signify a personal and sometimes painful set of stories. In an odd and contemporary linking between the natural and the supernatural, they are kin containing stories, travels, temporary shelter, memories of love, children, accidents, dogs, disasters and hope down the road. Once a suitable wreck has been negotiated, there has to be interest and desire from the community to set the project in motion. Every move is one of consultation; otherwise there will be no community project — just a classic case of whitefella toiling in the sun with blackfellas standing around in general amusement waiting for whitefella to leave, maybe leave some money, probably not come back. Lindsay Malay is our next door neighbour. He is part Aboriginal and part Afghan and very keen on this project, providing all kinds of help and practical assistance. But first things first: we gotta get smoked by Gabe. I’m wanting to get on with the project, but Tos assures me, no smoking, no project. He is right. I’m still not in tempo. So we get smoked and welcomed to country as it should be. We are staying in the “white house.” That’s not an ironic political name; it just happens to be painted white. The structure is also built on stilts to accommodate the heat and the wet; this also means snakes and other inquisitive animals are unlikely to visit. Wrong. On the second day my shoes are stolen from the balcony. A quick survey of the surrounds around Lindsay’s house finds dozens of single shoes masquerading as dog bones. Well, I find one shoe but the other remains missing (or dismembered). Our two canine crims turn out to be simply curious. They follow us around, more interested in displays of fighting than taking chunks out of our legs. “Us” is the excellent photographer Bohdan Warchomij, who has had guns pointed at him in his line of work in war zones, so deranged dogs amount to trivial pursuits. Despite signs in town demonstrating success with the de-sexing program, shoes and dogs become a running sub-plot over the next weeks. Two days later, the sole of one of my “tough Australian made” work boots falls off. Much to my amazement, Steve (who runs the East Kimberley Job Pathways workshop) has half a shop’s worth of work boot replacements right there in Warmun. The same cannot be said about the availability of functioning tools. It’s a challenge. As foreman Kevin explains, “someone has greater need than we do for functioning tools” and who’s to argue with that philosophical view on reciprocity? Barry, Walter and Glen are the Pathways home team and we get on well. Barry is completely skilled up on welding and unorthodox use of the Bobcat forklift, and he takes a keen interest in the redesign of the wreck. It is hard to assess what they really make of the project — possibly a passing apparition. Initially, we ask about two suitable wrecks but for logistic reasons they are not available. Lindsay introduces us to a local man who has ‘the’ Wreck beyond the beyond. Ceremonially burnt, no wheels, engine rusted to chassis, barely any floor left, the panelling decorated with dot paintings and representative Rainbow Serpent generated not by human hand, but by 20 years of weathering. We could have it, but how to get our beautiful Wreck to the workshop? From out of outback central casting steps “Chook.” With an excessively long white beard, ruddy face and an avalanche of expletives, Chook offers to bring it via the biggest forklift in town to the workshop and stick it…where was that? Somewhere dark where the sun doesn’t shine, if I remember right. Meanwhile, the temperature has risen to 34C in the shade, but the Wreck is not in the shade. I’m trying to show positivity by getting stuck into removing the drive shaft with an angle grinder. With sweat pouring off my face, extremely poor vision (due to a recent unsuccessful cataract surgery) and the thought that my left violin hand could be severed and sent flying across the yard at any moment, Kevin and Steve suggest we wait until the oxy-acetylene cutter is fixed — eh, maybe next week with a bit of luck. Whenever I see Tos, we break out with the Bernard Cribbins classic “Right Said Fred,” a 1960s pop song about a hapless gang of British workers under-employed in the piano moving business. Our piano is the Wreck. Days start to tick by and our time in Warmun is limited by all kinds of parameters, a performance date being the key one. Such linear materiality is not much of a currency in a community such as Warmun, but they humour us. Enter Dallas and Deno. They have the tools, they will do it, they need to be paid. And verily it was done upon the next day. No surprises there as Dallas and Deno have the government contract for fixing most of the roads in the East Kimberley and are the proud owners of the biggest wreck site and car spare parts in Warmun. They know their stuff. Last year’s Wreck was converted by the Bardi people of Lombadina and Djarindjin (170 kilometres north of Broome). An old Toyota ‘Troopie’ was selected, the engine removed (to be replaced by loudspeakers in the form of a V8) and a mass of ringing exhaust pipes welded to the side — it looked like a stunt vehicle from a Mad Max movie. A ladder and rack provided access to the roof and rotation hub section for players with the nerve to get up there. The bonnet (hood) was removed and welded to the side of the engine area for ease of access and was played as a large gong. Inside, the Toyota was stripped out of soft fittings, thus increasing the volume and depth of the principal resonating chamber. As is becoming de rigueur in these wreck projects, fence wire and strainers converted the vehicle into a formidable string instrument. More by neglect than design, all the doors of the Troopie still functioned, so cathartic door slamming became the thematic material for the whole three-week experience at Cape Leveque. Amplification, smoke and lights completed the show, which took place in front of the school, exactly on the border between the two communities (who very much run separate agendas). This year’s Wreck, by comparison, is a tougher proposition, as it is literally a rusted bucket with no working parts (e.g. doors). But if the last one took after Mad Max, this one is clearly influenced by the sails of the Sydney Opera House — an institution with which I have had a special relationship at times! There are three bonnets welded to the top of the cabin — clearly the Sydney Opera House! The hope is to encourage some of the exceptional painters at Warmun to get up there on a Bobcat and paint ’em up. There is a hinged percussion section bolted onto one side of the Wreck, and an abundance of 44-gallon drums in Warmun adds an auxiliary percussion section. The four fence wires are accessible both front and back of the Wreck. The engine and drive shaft have been removed to make way for speakers and other gear. 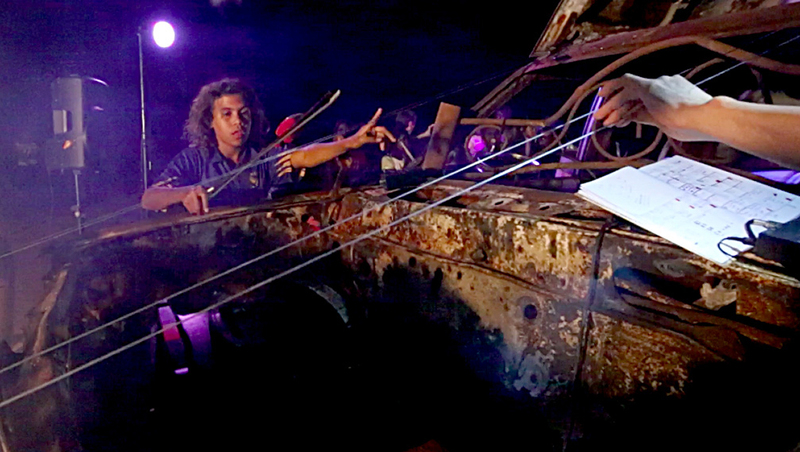 Wreck could be a neutral cultural zone in which to create connections between European and ancient Indigenous vocabularies and avoid such trite Jindyworobakism retrofitting orchestral works with a didgeridoo or simply cutting-and-pasting the exoticism of Aboriginal culture within dominant practices such as jazz or opera. Composers of popular and unpopular music have eaten out the supermarket of exoticism in any case; there is nothing left on the shelf that is not tainted. A car wreck is so far removed from an accepted musical practice that it allows a return to first principles and little in the way of baggage — or maybe it’s just a piece of sonic detritus (finally an end point to Cage’s love of traffic sound). The development of a music that discards much of the baggage of European and American cultural empire building is probably impossible to achieve in an internet age. But to my knowledge, there is no tradition of wreck music stretching back to the Renaissance and beyond; there are no popular music genres with car wrecks in the feature role like the electric guitar. (There have been performance art events with car wrecks, but these do not constitute an ongoing tradition.) In the context of Indigenous society, wrecks become the containers for a collection of embedded contemporary stories (I hesitate to use the word “dreamings” as I don’t want to push a whitefella’s presumption onto this proposition any more than I want members of the Warmun community to stand around singing “Kumbaya” or droning away on “Om”). The wreck is a canvas ironically clean of presumptions. But why don’t you just bring in some decent musical instruments for them to play? 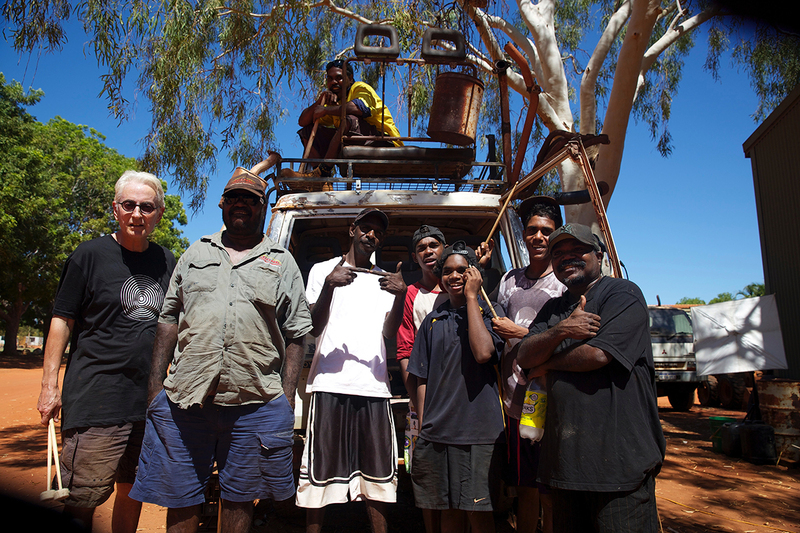 The arrival of a musical instrument in a remote community brings forth an ownership conundrum. It’s either owned by no-one or by everyone (or at least everyone related through the kinship system of moiety). Apart from the pressure of humbugging, there are problems: who will replace the strings on the guitar, where are the drumsticks, how to fix the amp? A wreck is already part of the community — it can be transformed, but it doesn’t need fixing. Gabe gives us permission to set the Wreck up on the Joonba ground. This is the community place of spiritual and celebratory dance gatherings. Gabe, not knowing what wreck music is going to sound like, is hedging his bets: we are allowed on the edge, not the centre, of the space. Over the next days, we are visited by various age groups from the school; the teenage boys’ class goes wild. They reduce some of the side drums to crumpled metal. Their teacher controls them with an ear-shattering cyclone whistle. Straight out of Picnic at Hanging Rock, a visiting party of Perth private school girls try their hand: they push the violinist in the class forward to bow the amplified fence wires. I have made samples of every aspect of the Wreck, including the non-existent motor and horn; with these well-audible in the live mix, and some quick demos of technique from time to time, the music just goes off. The first half of the advertised concert features a junior class playing homemade harps designed and instigated by Catherine Ashley. Not your average symphony harpist, Catherine is up for all things challenging beyond the concert hall. Now it is common knowledge in the music business, don’t go on stage with children or animals. Catherine’s tiny tots have the audience hooked, oohing and aahing in seconds; then, almost on cue, it’s time for the wild dogs to attack and all hell breaks out with screaming kids running helter skelter. Like a tropical downfall, it’s all over as quickly as it commenced and the Wreck is cranked into action. Soon enough the energy of metal, fence wire, smoke and lights takes centrestage. As with last year’s manifestation, after some initial shyness, it’s often unclear who is in the tag team and who’s just hanging out. Eventually the smell of food wafts into the performance area and…enough of all that wreck stuff. Everyone rushes to fill their stomachs. Food is a big drawcard. On the second night of performance, kids of ages 5-12 play for several hours, in the course of which they go from beginners who have never held a drumstick or a bow in their hand to some sort of self-educated, fresh, joyful yet incomprehensible system, with waves of sound penetrating the night air. Some might say a music of chaos; others would say a music of polyrhythms. Intense, yes. They play long and hard. There’s no food tonight. The power goes down and sound man Guy Smith disappears into the darkness under the gallery director’s house to wade through all the squelchy cane toads to re-connect. The smoke machine is still pumping and Catherine, playing fence wire, looks like she is about to pass out. Meanwhile, the talented dancer who had committed to performing around the Wreck shows up on crutches, injured in last night’s basketball contest. The morning starts in Warmun at 5am with raucous mass fly-pasts of ravens, cockatoos, corellas and a host of other hyperactive avians. Amid the mayhem, pied butcherbirds start up a golden duet in the nearest highest tree (song post). Blinding sun reveals the day. The symbiosis of staggering beauty and piles of trash is a common enough outback trope in both white and black communities. In Warmun, there are grey-haired nomads and the odd big art sale to think of, so large signs point to the trash bins. In the traditional way that South Sea Islanders left their pre-industrial trash on the beach and let the tide take it away, so the original inhabitants of Australia let nature take its course. It’s just that with plastic, tin and wrecks, Nature needs a lot of years to take its course. Many inhabitants of Warmun simply don’t see trash, and after a few weeks here I’m not sure I’m seeing it either. 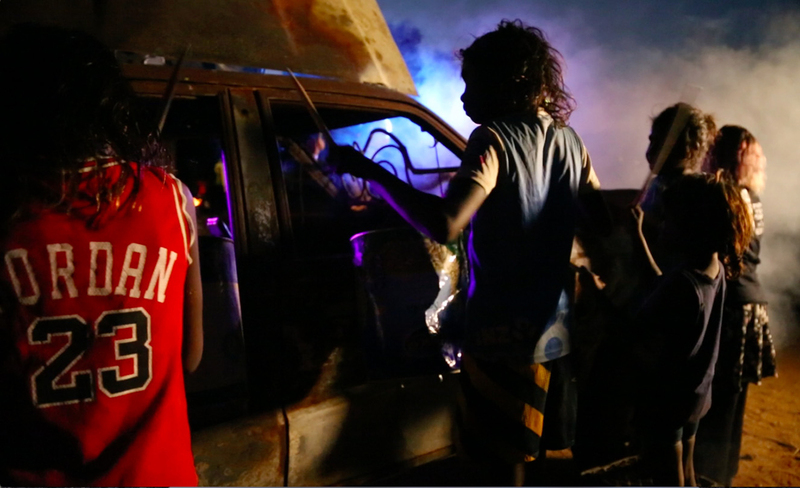 Aboriginal people have a casual disregard for the tenets, products and detritus of capitalism. It is not that they are wilfully refusing economic orthodoxy, they simply have another take on what’s important, another take on ownership — a 65,000 year point of view linking the critical animate and inanimate forever. Things can be discarded, kinship cannot. The Wreck Residency has been produced in 2016 and 2017 by Tura New Music in association with the Warmun Arts Centre and with the support of the Ian Potter Foundation and Healthway. The first Wreck performance took place in 2012 in White Cliffs, NSW. In 2013 a wreck was hauled 1,000 kilometres from White Cliffs to Carriageworks to be performed as part of the Sydney Festival.